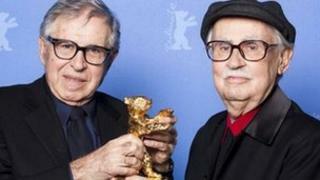 The Italian docu-drama Caesar Must Die has won the Golden Bear prize at the Berlin Film Festival. The film, directed by veteran brothers Paolo and Vittorio Taviani, follows a group of real-life convicts as they rehearse for a prison performance of Julius Caesar. Critics said the fact that most of the cast were prisoners intensified the drama of Shakespeare's tragedy. The film was among the favourites to win the prestigious award. "We hope that when the film is released to the general public that cinemagoers will say to themselves or even those around them... that even a prisoner with a dreadful sentence, even a life sentence, is and remains a human being," Paolo Taviani, 80, said as he accepted the prize. His brother Vittorio, 82, read out the names of the inmates who took part in the film. The festival's judging panel was led by veteran British director Mike Leigh. However, the big winner was not wholly praised, with German website Der Spiegel calling it a "very conservative selection." Trade newspaper, the Hollywood Reporter, called Caesar Must Die's victory "a major upset". The winner of last year's Golden Bear, Iranian film A Separation, has since gone on to be nominated for best foreign language feature at next week's Oscars. The runner-up award went to Just the Wind, a film inspired by a spree of gypsy killings in Hungary. Best actress went to 14-year-old Rachel Mwanza from the Democratic Republic of Congo, for her first ever film role in War Witch. Danish performer Mikkel Boe Folsgaard, took home best actor for the costume drama A Royal Affair. The film also won best screenplay. The best director award went to German filmmaker Christian Petzold for Barbara, about a woman plotting to escape communist East Germany. Last week at the festival, Iron Lady star Meryl Streep accepted an award recognising her five-decade career.